Scientists at the Yale School of Engineering & Applied Science have developed a microelectronic device that controls the flow of ions through a nanometer channel that mimics the function of real cells. The construction of artificial cells is a long-sought goal. Researchers from Yale University has made one step toward that goal, by creating a microelectronic device that controls the flow of ions through a nanometer channel that mimics the function of real cells. 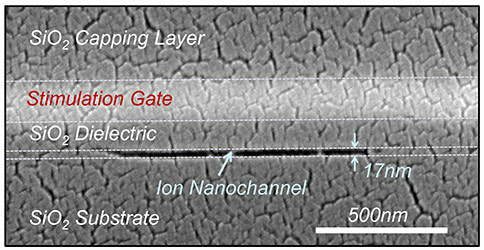 In this month’s issue of Nano Letters, graduate student Weihua Guan with his advisor Mark Reed, demonstrate a “nanoionic” device that performs the same function of an ion channel in a cell membrane, creating a “membrane potential” by selectively controlling the ion flow through the device, an abiotic analogue to voltage-gated ion channels in living systems. “This is an exciting result because it shows that solid state devices can selectively control ion flow in the similar manner as real cells,” says Weihua. The research showed that one can adjustably create ion gradients, which causes the electrostatic potential necessary for proper cell function. However, the results may even be farther reaching, with potential impact on batteries, water desalination, or microelectronic circuits that interface with biological systems. Be the first to comment on "Engineers at SEAS Develop a Microelectronic Device that Mimics Functions of Real Cells"